Deepavali as we know is marked by the sweets and savouries made for the occasion. The day of Deepavali starts with the early morning oil bath, new dresses, poojai with the – ever tricky athirasams. 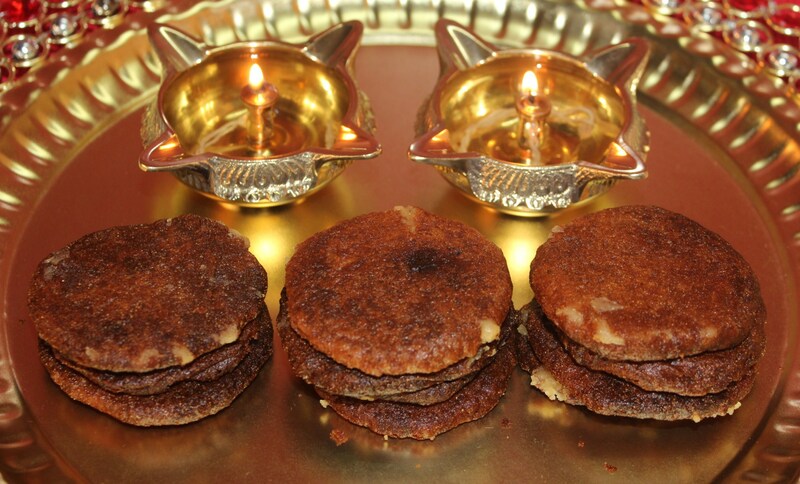 Athirasams are fried delicacies made of rice flour and jaggery. 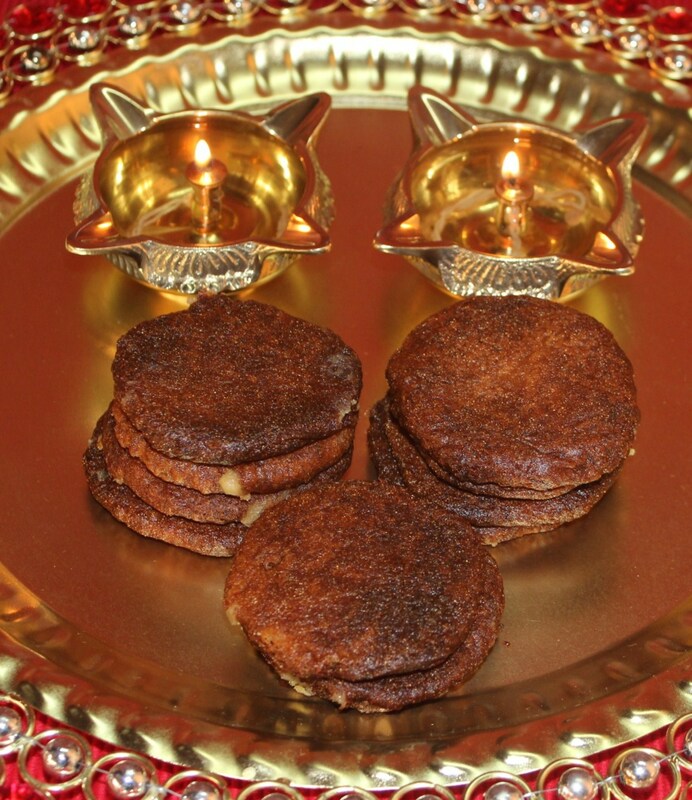 The texture of athirasams depend on the jaggery syrup and quality of rice flour. Generally, raw rice is soaked and dried at home and powdered, then used with jaggery syrup to make this exotic sweet. But rice flour from the store (fine quality) can also be substituted. The result might not be the best. I have used rice flour from shop – the shop did not have raw rice but had rice flour – hence I opted to settle with that. Athirasam as the name suggests means very tasty or might be ‘x’ factor in taste! It certainly has it. 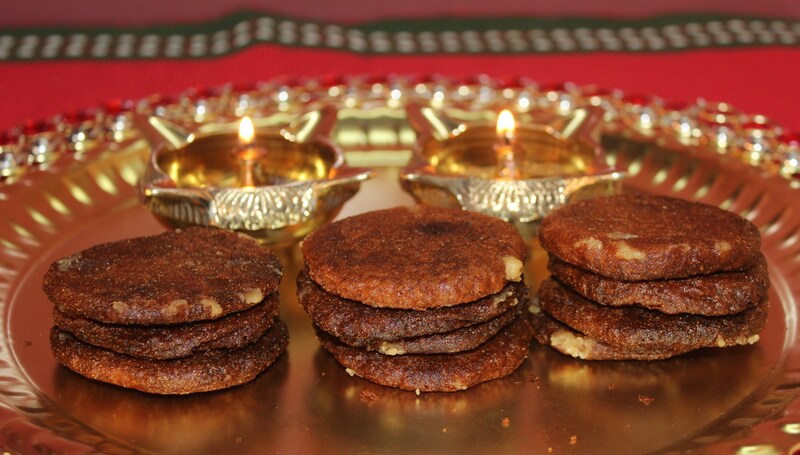 All other sweets and savouries are prepared the day before Deepavali and Athirasams are a morning poojai affair. At my parent’s home on the Deepavali morning, as children we would be busy trying the new outfit/outfits and enjoying sparklers and crackers. So, I did not really have the experience in helping or making athirasams – it was restricted to tasting alone. After marriage, specially at my husband’s granny’s (paatti) home, I could be part of the athirasam making team of youngsters! The chief cook is always the octogenarian or nonagenarian granny – she doesn’t know her age – but calculating through her first son’s age, she could be in her nineties, but by her active cooking abilities – this is difficult to admit. She makes flat athirasams on banana leaf, and guides her helpful daughter-in-laws to fry them to perfection, and other grand-children would be pressing excess oil out of the hot athirasams… This was thoroughly a watcher’s delight! First time, I joined the children’s gang to press out oil (atleast a hundred athirasams would be fried); Next deepavali, I graduated or got a double promotion sitting near paatti (grandma) to make flat athirasams on banana leaf. She wouldn’t allow me in front of the oil stove to fry! Making athirasam was so easy this way…but to make it alone for the first time is quite a difficult one. Making the dough for athirasam is a very delicate work which has to be done with caution. If the consistency of the jaggery syrup is not right, the athirasams might break inside oil or turn out strong enough to break your enemys’ teeth! Being a high level optimist, I felt I was quite lucky this time – (oh, I don’t mean breaking anyone’s teeth but talking about athirasams) though not perfect as amma’s or picture perfect as paati’s athirasams – they tasted good enough though didn’t look the most perfect! They were not hard but surely lacked the oily glow, one of the special features of athirasams. I didn’t know whether I should be happy about the less oil texture or worry about the missing originality… Then, I decided I would worry about the latter. The reason behind the not-so-good outcome might be the quality of rice flour or the more likely culprit – consistency of jaggery. I am going to try and rectify these known mistakes. Suggestions regarding this are always welcome. But since this is the proven right recipe by amma and paatti for making athirasams…might be you get it better than mine! Next time, I am going to try with raw rice from scratch…ofcourse when it is available in the Indian grocery shop (better athirasams in the near future). ***The next time of good Athirasams arrived recently, from Athai/Aunt, who gave me a perfectly done dough to be stored for months. This has been a loving way of making Athirasam available all the time, when you are out of your home town. The prepared dough has been stored in the refrigerator. I follow these simple steps for the true joy of Athirasam. f. Serve and enjoy tasting every bit of it. 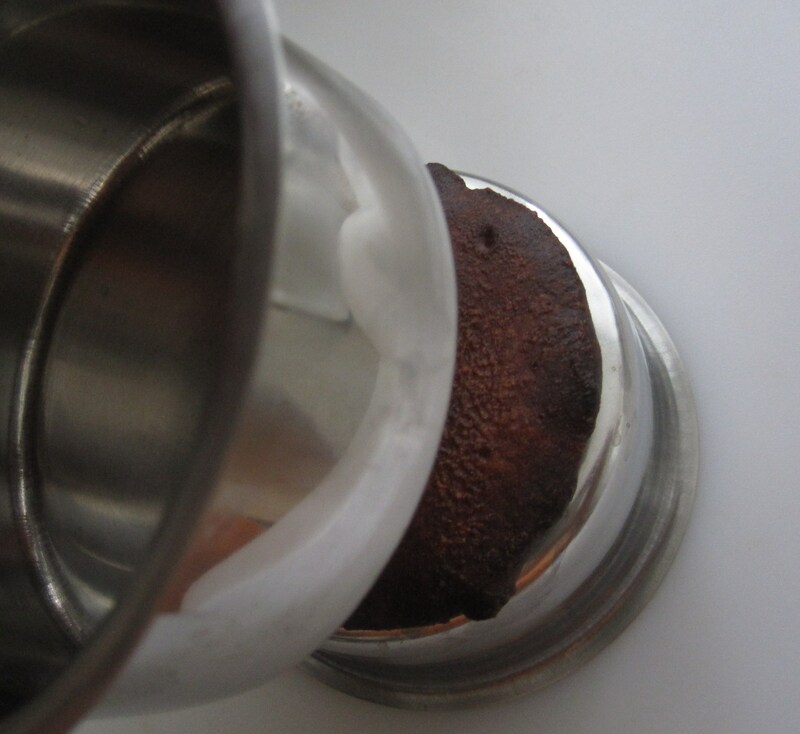 The syrup should be two string consistency – When the jaggery is boiling well in the vessel – keep a bowl of water and add a few drops of the syrup. 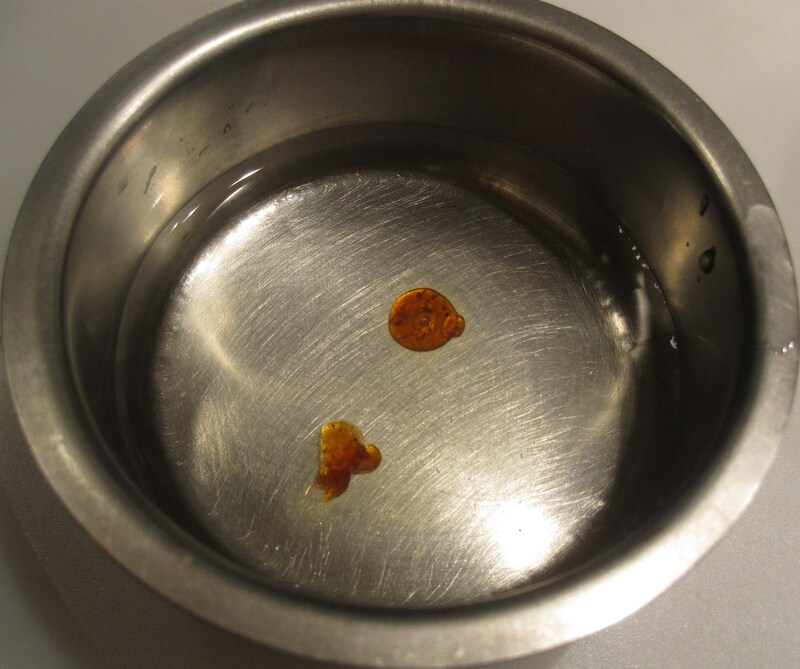 The drop should settle in water and one should be able to make a ball out of it – it should not be too sticky. This is the right consistency of syrup. Keep the dough closed overnight. Store in containers. Athirasams become softer after a while. If the dough thickens or is stiff after 12 hours – add 1 or 2 tsp of curds/yoghurt and knead well to bring it a soft dough consistency. Some might also add milk instead of curds. If one finds the sweetness of athirasams less or more, texture of athirasams soft or hard, can be altered in the next attempt! There is always another chance!! I wish everyone a very HAPPY DEEPAVALI! Previous Post Sweet and Special Somasi! i suggest u to powder the soaked rice in the mixie it will come good&soaking time of raw rice is important 6to8 hours. That was the problem – the indian grocery store didn’t have pacharisi/raw rice. I am waiting for its arrival to make from scratch. thanks for the advice. pleasure to see ur website.